You can define Swim England Registration fees and have them automatically be charged during online registration. Chameleon users: In the side menu click Billing Admin > Billing Setup. New CMS users: In the side menu click Financial Tools > Billing Setup. 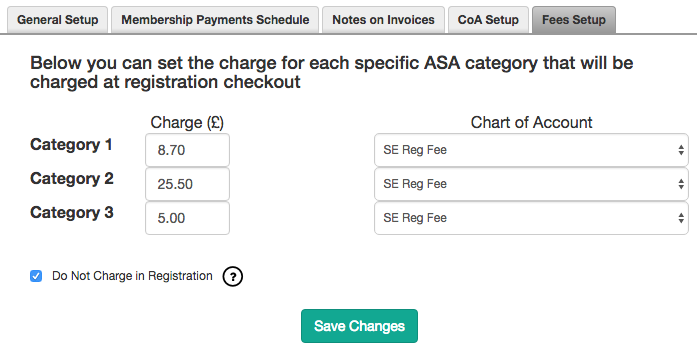 If you need to add a chart of account for the SE fee, do that on the CoA Setup tab. Enter the fee for each SE Category and select the Chart of Account for each one. Uncheck Do Not Charge in Registration if you want to charge the SE fees during registration instead. Read how to Require SE Registration information during online registration and follow the steps there. When people register online and select their SE Category, it will charge the fee you define in the first set of steps above for each athlete registered. The final step is to Mark SE Registration fees as paid once people have paid them.